Canadian novelist and author of the quintessential 90s novels, Generation X and Microserfs . 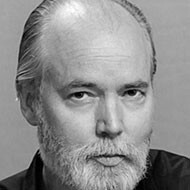 Douglas Coupland is a Canadian author who is credited with popularising the terms 'Generation X' and 'McJob' in his 1991 novel, Generation X . He grew up in a Canadian military family and went on to study science at university before finally studying art at the Emily Carr University of Art and Design, then at the Design Institute in Italy and the Hokkaido College of Art and Design in Japan. He became a writer 'accidentally' when a skin condition forced him to leave Tokyo. A friends husband offered him a writing position at a magazine and Coupland took up the work to pay his bills. In 1991, after two years of living in the Mojave Desert, Coupland published Generation X . The novel struck a chord and became a genuine phenomenon. Since then he continues to write novels and even returned to his original roots in visual design. He currently lives with his partner in West Vancouver, Canada.